Nembrotha purpureolineata, was named from a preserved specimen from Abrolhos Is., Western Australia (O'Donoghue, 1924), but the short colour description is probably enough to identify it to be the same as Nembrotha rutilans Pruvot-Fol, 1931), another poorly described species which was based solely on a painting of marine life from the Great Barrier Reef (Saville-Kent, 1893)[see #21418 ]. The background colour is creamy white, but much of this is obscured by a large brown, charcteristically shaped patch which covers most of the dorsum. There is a brown band running around the head and anterior end of the mantle and there are usually longitudinal brown bands down each side of the body. In some animals the brown patch is broken into a few broad irregular longitudinal patches, and in few instances a number of brown lines. The rhinophore sheaths range from white to pink or purple and often have a dark brown band at the upper edge. The rhinophore clubs are red or orange-red and the stalk is usually pink or purple. The gills are orange or reddish orange and the gill stalks are white often with some pink or purple colouration. The foot is often edged with purple or at least faint traces of purple. Previously on the Forum this species was identified as N. rutilans and most specimens identified as N. purpureolineata are now identified as the new species N. aurea [see message #21419]. O'Donoghue, C. H. (1924) Report on Opisthobranchiata from the Abrolhos Islands, Western Australia, with description of a new parasitic copepod. Journal of the Linnean Society, London 35: 521-579, Pls.27-30. Pola, M., Cervera, J.L. and Gosliner, T.M. 2008. 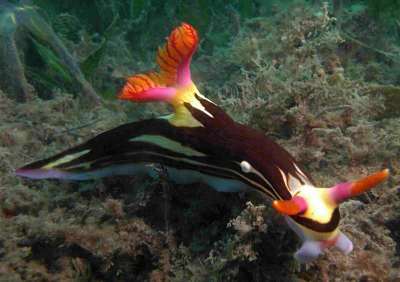 Revision of the Indo-Pacific genus Nembrotha (Nudibranchia: Dorididae: Polyceridae), with description of two new species. Scientia Marina 72(1): 145-183. Wells, F.E. & Bryce, C.W. (1993). 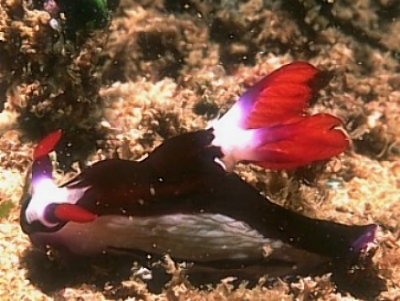 Sea Slugs of Western Australia. Western Australian Museum: Perth. ARCHIVE NOTE: An earlier edition of this Fact Sheet [16 Dec 1998] as nembpurp_16121998.pdf is available on request.